Australia’s top business body is tapping Global expertise to help local businesses address the huge challenges of multigenerational workforces. The Australian Chamber of Commerce and Industry’s new conference series leverages lessons from global innovators like Netflix as businesses learn to meld the skills and expectations of five distinct generations in their workplace. Businesses ignore these barriers to productivity at their peril, and 2018 is the year they need to overcome them, according to James Pearson, chief executive officer of the Australian Chamber. He says: “We are on the cusp of a momentous time in history, where there will be five generations working together for the first time. Understanding how Gen Z, Millennials, Gen X, Baby Boomers and Traditionalists think differently, and creating a workplace environment where everyone can thrive will be the next big test for business. 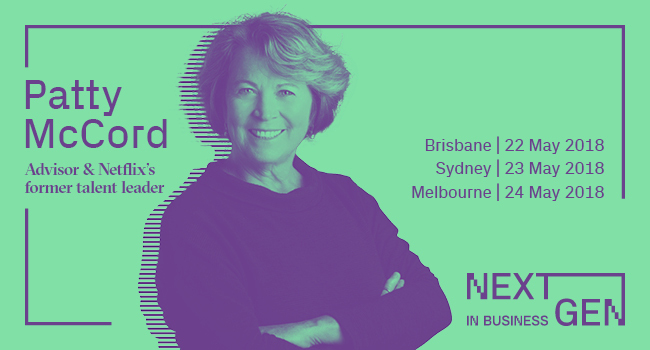 As part of its commitment to helping businesses prosper the Australian Chamber is launching a new conference series called NextGen in Business, bringing together top global and local thinkers to share their skills and experiences. International speaker Patty McCord is the co-author of one of the most important documents ever to come out of Silicone Valley, Netflix’s Culture Deck, which has been viewed more than 15 million times since it was first published. As chief talent officer of Netflix, Patty was responsible for putting that document into practice, creating new business models and eliminating old ones, in a company hailed as one of the most transformative influences on contemporary culture. High-profile international keynote speaker Tom Goodwin, a leading global innovation and business transformation thinker, is confirmed for the conference series. As executive vice president for innovation at media agency Zenith USA, he helps the world’s biggest companies understand the opportunities that new technology brings. For the last two years Goodwin has been named as the number one voice in marketing by LinkedIn, and he is ranked in the top 30 people to follow on Twitter by Business Insider. Social researcher, author and generational engagement expert Claire Madden will be master of ceremonies for the series. · Assimilating a flexible and diverse workforce. More speakers and session information will be added to the program as details are confirmed. The NextGen in Business conference series is presented by the Australian Chamber of Commerce and Industry’s Biz Better Together initiative, supported by funding from the Department of Employment through the Productivity Education and Training (PET) Fund.